Sol Wave Water offers comprehensive water testing services for: Dishwashers, Cooling Towers, Laundromats, Pet Shops, Offices, Restaurants, Department of Heath Documentation, Hotels, Home Owners Associations, and many other industries. We offer many services specifically tailored to our commercial clients. We understand the importance of the quality and consistency of your water. Water plays a key role in the efficiency of your business, we can identify if the water is contributing to issues you are facing. Please call our office to schedule an appointment for any of the above free water tests we offer. We also offer onsite testing if you would like us to come to you. Hard water causes thousands of dollars in damage to infrastructure, equipment and appliances. Not all water in our area has the same harness level, and with the new desalination plant coming online there will be new unknown fluctuations in the hardness levels of the lower State Street through upper State Street areas. Most of our area ranges from 22 grains per gallon to 30 grains per gallon, there are areas of town where we are seeing reading as high as 55 grains per gallon. If you have a water softener, and you want if to run efficiently, it is critical that it be calibrated for the water hardness you are currently receiving. Hardness water testing and softener calibration is free at our office or as a first time service call to your business. Please call (805)845-5443 or email to schedule an appointment. Santa Barbara and Goleta are currently facing a new challenge with elevated copper levels exceeding the maximum contaminant level for drinking water. If you are serving food or beverages made with tap water you need to know what the levels are. High levels of dissolved copper can cause blondes hair color to become green or hare to have a greenish tint, toilet bowls and bath tubs can take on a blueish green color. We have also seen a correlation with brunettes, and blondes, hair to become brittle and dry with high copper levels. The primary MCL standard for copper in potable water is 1.3 ppm or 1300 ug/l. If you suspect you have high copper levels in your water please call (805)845-5443 or email to schedule an appointment. In addition to our basic complementary water testing we also offer analytical testing and reporting for process water with or without certified reports. These include and are not limited to: Lead testing, Copper in water testing, general mineral, Giardia and Cryptosporidium, E. coli, radioactive, and many others. please call (805)845-5443 or email for additional information and chain of custody options and pricing. The most common pressure call we get is from high pressure that is causing leaks in your home or business. Knowing your static water pressure is important, and knowing your dynamic pressure is more important. 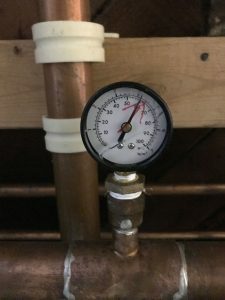 Thermal expansion can be an evasive problem to detect, if you keep having leaks and have been told your pressure is fine, you may be suffering from thermal expansion. Low water pressure can be caused by a number of factors: An old water softener, a failed or clogged pressure regulator, scale buildup from years of hard water or a number of other issues. A measurement of total dissolved solids will answer the question “how much stuff is in my water?”. This is the most common test to determine if you need a reverse osmosis system or if the membrane in your reverse osmosis system needs to be replaced. The most common measurement with TDS is reported in Parts Per Million of total dissolved solids. It is not uncommon that the ray water in our area is between 350-575 ppm of TDS. 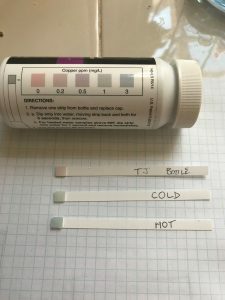 This reading TDS is the total of elements like calcium carbonate, sodium, potassium, iron, copper, or the other elements dissolved in our water. The most common elements are reported with averages on the city water quality report that is annually produced by the municipality providing your water service. For Santa Barbara City Water Quality Report click here. Basic TDS testing if free at our office, please call (805)845-5443 or email to schedule an appointment. On November 20th, 2015, the NYC Department of Health and Mental Hygiene filed a proposed resolution to add a new Chapter 8 to Title 24 of the Rules of the City of New York which would establish ongoing rules for cooling towers maintenance to prevent contamination from legionella bacteria. The presumption is that the requirements outlined in the DOHMH’s proposed Chapter 8 would be incorporated into the mandatory Maintenance Program and Plan, which is required to be in place by March 1st, 2016.